I've had a novel in mind for more than a decade and I am finally getting it into shape, with the help of excellent faculty guidance and collegial support. While researching Christine de Pizan’s manuscripts, Prof. Verity Frazier stumbles upon evidence indicating some of the most beautiful designs in the collection have been the handiwork of a woman. The novel flashes back to the fourteenth and early fifteenth centuries to recreate an imagined relationship between Christine de Pizan and Héloise Tapis, a remarkable woman employed by de Pizan to illuminate her manuscripts. The obstacles facing these women in the past reverberate into the present as the novel returns to the 21st century when Prof. Frazier confronts resistance to her efforts to document Tapis’s significance in Pizan studies. Exploring themes of religious scandal, political corruption, catastrophic disease, and gender and class conflict through the lens of an era the historian Barbara Tuchman called “a distraught age whose rules were breaking down under the pressure of adverse and violent events,” the story tracks a time remarkably similar to our present. 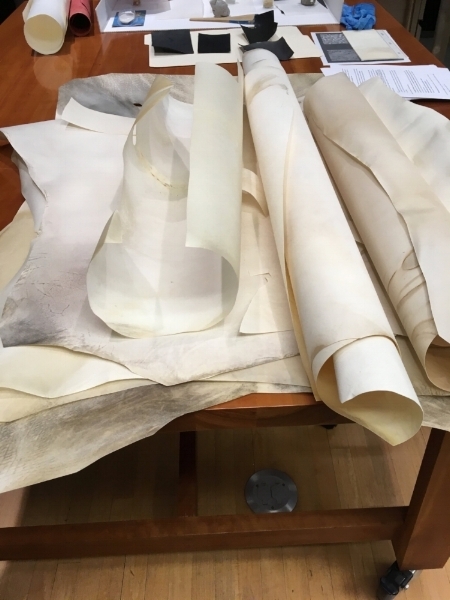 The research has been an extraordinary experience for me, taking me to the Morgan Library, where I learned about parchment production, and the British library in London, whose collections of Christine's works provide the setting for some of the novel's contemporary scenes. Christine de Pizan manuscript, British Library. But it's the imaginative process of writing that will engage me fully in the coming months, as I develop further the voice, character, and structure with which to tell this story. I have had the expert guidance of Eugenia Kim, whose novel writing workshop at Enders spurred me further into the development of my craft. And I will be working with Karen Osborn this fall on structure and voice in the novel.